You are at:Home»Ireland»Ireland Women»Ireland Women Sevens»Ulster duo enjoy Ireland U18 Home Nations Sevens Success. 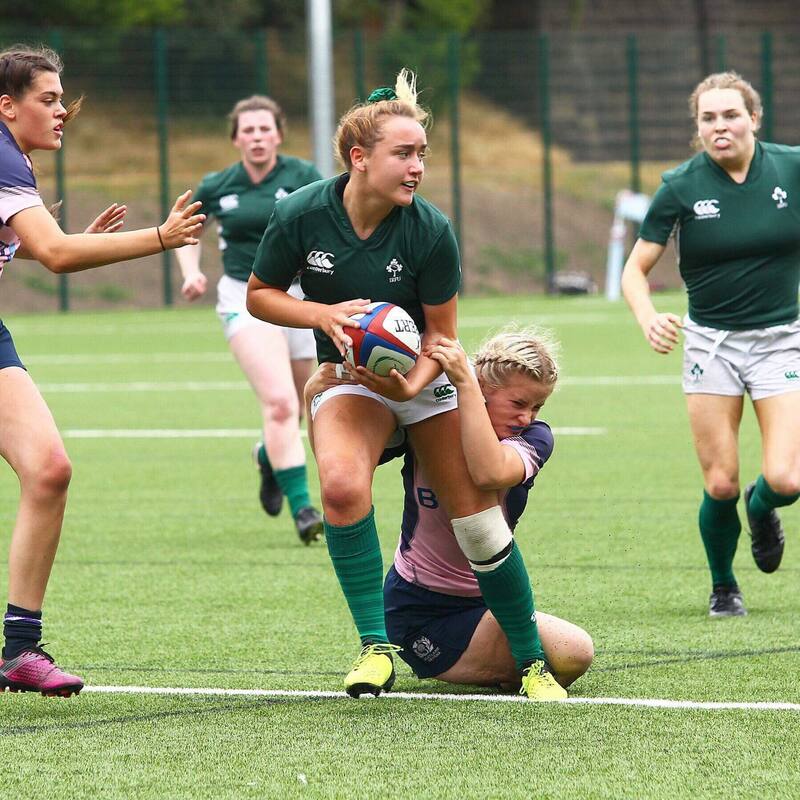 Ulster U18 Players Lucinda Kinghan and Katie Hetherington were part of the hugely successful Ireland U18 sevens team that completed their second Home Nations U18 Sevens clean sweep at Birmingham University over the weekend. Heatherington was competing in her first tournament and featured in three of the games while veteran Kinghan featured in all five. Kinghan and Hetherington spoke to the Front Row Union’s Vicky Irwin after the tournament. “It was another thoroughly enjoyable tournament and we are delighted to have retained the title of Home Nations Champions. 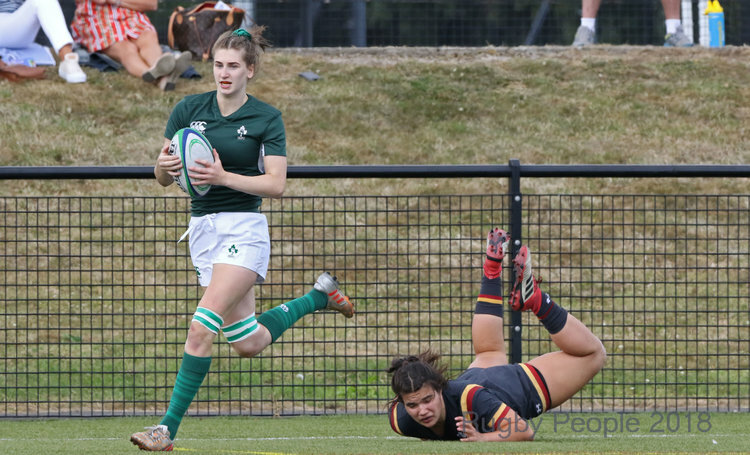 Katie Hetherington in action for Ireland U18 v Scotland. Picture credit Stephen Hetherington. I really enjoyed the opportunity to be able to play with the girls in this tournament and to experience winning the title. Each nation was a challenge but all of us stepped up and worked for each other in every match to retain the trophy. Ireland: Dorothy Wall, Katie Hetherington, Lucinda Kinghan, Meabh Deely, Megan Burns, Anna Doyle, Saoirse O’Reilly. Replacements used: Maggie Boylan, Beibhinn Parsons, Meadbh Scally, Molly Fitzgerald, Aoibheann Reilly. Ireland: Dorothy Wall, Maggie Boylan, Lucinda Kinghan, Aoibheann Reilly, Megan Burns, Beibhinn Parsons, Anna Doyle. Replacements used: Meabh Deely, Meadbh Scally, Molly Fitzgerald, Katie Hetherington, Saoirse O’Reilly. Ireland: Meadbh Scally, Katie Hetherington, Molly Fitzgerald, Meabh Deely, Aoibheann Reilly, Beibhinn Parsons, Saoirse O’Reilly. Replacements Used: Anna Doyle, Maggie Boylan, Lucinda Kinghan, Megan Burns, Dorothy Wall. Ireland: Dorothy Wall, Maggie Boylan, Lucinda Kinghan, Meabh Deely, Megan Burns, Beibhinn Parsons, Anna Doyle. Replacements used: Aoibheann Reilly, Meadbh Scally, Molly Fitzgerald. Ireland: Dorothy Wall, Maggie Boylan, Lucinda Kinghan, Meabh Deely, Megan Burns, Beibhinn Parsons, Anna Doyle. Replacements used: Aoibheann Reilly, Meadbh Scally. Previous ArticleRWC Sevens 2018: Ireland Men finish Ninth.